There's a very pleasant hike along a trail accessible from Auke Bay / Mendenhall Lake that I've hiked most years (when the weather has been nice). The rugged trail takes one to the rocky, nearly barren landscape shown in the first graphic above. Until recently I would carry crampons and an ice axe and transition from the trail onto the glacial ice, but because of the glacier's retreat this is no longer feasible. 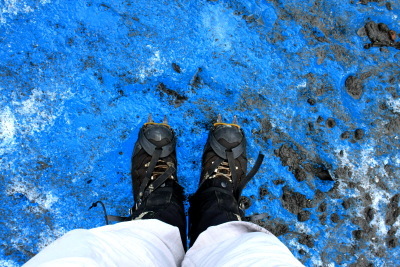 The locals tell me this glacier is retreating at a rate of one foot per day. As should be clear from the graphic above, the glacier is expected to lose contact with Mendenhall Lake within the next few years (meaning no more icebergs in Mendenhall Lake). 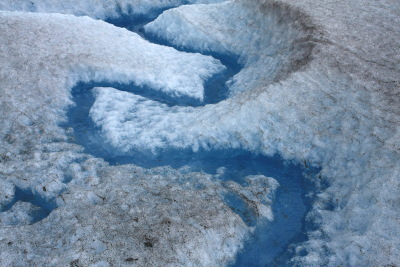 Since 1500 A.D. the glacier has retreated over 2.5 miles. When I hear someone try to say global warming is a myth, I think about how fast this glacier is disappearing. Be sure to view this photosphere of the glacier and its environs.